I’m attracted to the market opportunity within large, established markets. These markets already have huge spend, they have established dominant players with an inertia resistant to major change, most of the innovative talent and money is off in new market spaces, and innovation within these spaces tends to be evolutionary in nature and follow predictable paths. The revolutionary innovation that occurs in many of these markets is often serendipitous. That means someone isn’t looking to solve the end problem, but something they did is applicable to it. See, for example, Viagra or Post-Its. More often than not, however, the real revolutionary innovation is in line with the evolutionary. Therefore, pick a really big market and do something revolutionary within the natural evolution of the space. So the key question becomes: what is it that successful inventors do to be revolutionarily successful within an evolution? —Design for how people work. —Consolidate and reduce core concepts to a ridiculous minimum; a core concept is anything the customer has to learn or understand in order to successfully use your product. Mobile phones, e-mail on Blackberries and Treos, MP3 music players—all of these existed separately and with ever-expanding feature sets. The race toward consolidation had been going on for some time; but it carried with it the complex, rich feature sets of each independent device. experience one that requires the customer to learn nothing new. There is no way to mess up, no configurations to understand, no compatibility to sweat. And, let’s get rid of everything but one button. Nothing forces simple concept consolidation like the absence of knobs to turn. That’s why the bottom line for innovation success in a crowded converging market is the reduction and consolidation of core concepts. There is a close parallel to the iPhone story in this saga. The approaches taken by the companies vying for the prize have fallen into different categories, each of which has its special purpose, and each of which continues to pile on the features to stand out above the noise. 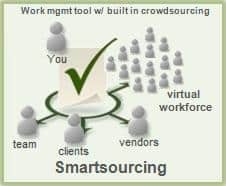 There are wikis for data collection and discussions, there are project management tools for structured deliverables tracking, there are online office applications to solve the sharing dilemma among many people, there are simple task management tools for personal to-do’s, and so on. All of them are overkill in their category, and all of them are applicable to only a minority few with special needs for their deep feature set. Many understand the need to consolidate and bring the disparate functions together. However none is capable of doing the transformational work necessary to reduce and consolidate all the core concepts in their products to something universally simple and consistent across each. It would mean starting over entirely in almost all cases. —Online is a big enabler. —Account-based (individually-centered) services are better understood. —Salesforce.com has made team SaaS tools mainstream. —Workforces are increasingly more distributed. —Outsourcing of component deliverables is increasing. —Pressure to coordinate across multiple people and multiple sources of information is only getting greater. A consolidation of the core concepts in the five major approaches to work collaboration is inevitable. Designing that consolidation for how people actually work is the other half of the revolution in this evolution, but that’s for another post.